Phil came quickly to give an estimate. He explained everything in a thorough manner being friendly and professional. He got the work done within my timelines and even did a little extra project! I'll call Varco again when it's time to do my windows. Sunny...attractive...spacious...just a few words that describe bay windows and bow windows from VARCO. Create a breath-taking focal point in your home with a custom made vinyl bay windows or vinyl bow windows from our Vinyl Replacement Window Collection. These handcrafted bay and bow windows feature our energy-efficient vinyl windows combined with an interior header and seat of hand-sanded, furniture finish birch wood, or an optional oak veneer. Now also available in a wide variety of painted exterior colors. Since all our vinyl bay windows and vinyl bow windows are custom-made for your home, you have a wide array of choices to enhance the appeal of your home. 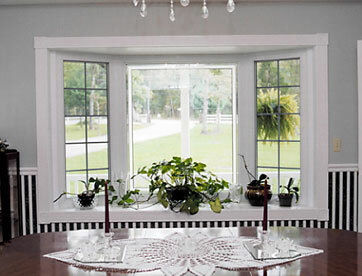 Our bow windows and bay windows are available with casement windows, double hung windows, or fixed window vents. Select a roof style for your bay window or bow window that will accentuate the architecture of your home including custom shingled or metal, hip or shed style roofs. Exclusive to the industry, our manufacturers assemble the entire bay window or bow window at the factory, assuring the highest quality standards are maintained. No exposed exterior wood on any of our bay and bow windows. Select from Dual or Triple-Pane Insulating Glass Systems featuring LoE2 Glass, enhanced with Argon or Krypton Gases and sealed with Warm-Edge Technology Spacer Systems. We offer a variety of high-performance, insulating glass systems that help qualify our products for the ENERGY STAR label.